Only John T. Frye can turn an episode of an electronics technician / tinkerer attempting to devise a method of blowing up mosquitoes with sonic waves into a lesson in solving television and radio servicing issues by listening to the audio and interpreting CRT test patterns, as applicable. Mac's young apprentice is introduced to the recently released troubleshooting volumes - called 'Pict-O-Guides' - published by RCA which presents a set of uniquely distorted television test patterns (recall the Indian head test pattern) with an explanation of which circuit likely cased the problem(s). I note that Barney was told to take the Pict-O-Guides home to study them on his own time rather than while on the clock. "Excuse me for mentioning it, Buster, but aren't you slipping your clutch again? Talking to yourself makes you live bait for the boys with the butterfly nets, you know." "I'm not talking to myself," Barney protested. "I'm talking to that blood-sucking mosquito in the wire cage." "Well, then; that's different!" Mac said with exaggerated relief. "All of us like to have a little chat with a mosquito now and then. Will the two of you excuse me for interrupting?" "You quit trying to make it sound like I was losing my marbles," Barney shouted. "Outside of being crazy enough to work on radios, I'm as hep as the next guy and maybe a little hepper. "The whole thing started last night after I walked Margie home from the show," he went on. "It was the first really warm night we have had; the moon was as big and bright as a twenty-inch tube; and her old man had just put up the porch swing that afternoon. In short, things were perfect for a little front porch woo-pitching-or 'sparking' I believe they called it in your day." "Thankee kindly fur the translation, young feller," Mac piped in the cracked, falsetto voice of age. "Well, we had no more than snuggled down in the porch swing than a squadron of mosquitoes started dive-bombing us. You probably are too old to remember, but smooching takes a certain amount of concentration. You can't get very far whispering sweet nothings into one shell-like ear while a mosquito is making like a miniature fire siren in the other. After I had intercepted a couple of wild swats Margie was making at the pests - at least I think that is what she was doing - I gave up and went home and to bed; but I didn't go right to sleep. Instead, I lay awake and thought up a fiendishly clever way of clobbering mosquitoes. "And there it is!" he said waving dramatically at the service bench. "A captured mosquito is in that little screen cage. Directly in front of the cage and pointed at it is a tweeter speaker that is being driven by the output of that hi-fi amplifier. Our audio frequency generator is going into the amplifier." "I get it!" Mac interrupted. "You're going to drive the insects mad by out-singing them." "Worse than that," Barney said darkly. "I intend to tune the oscillator to the natural vibration frequency of either the mosquito's body or his wings - it makes no difference which - and then I'll simply shake one loose from the other with the compression and rarefaction waves from the speaker. Because of the small masses involved, I figure the frequency will be too high to be heard. This arrangement will be set up on my porch with the speaker pointed toward Margie's. Boy! I can hardly wait until tonight to see those de-winged mosquito fuselages ploughing into the porch paint around that swing!" "Hm-m-m-m,' Mac said a little dazedly, "And how is your experiment panning out?" "Aw, Old Buzzo there won't cooperate," Barney said disgustedly. "I've got to catch him on the wing to try out the gadget, but all he does is sit there with his toenails dug into the bottom of the cage." "We-l-l-l, let's not fret our little pointed head about it now," Mac said soothingly. "After awhile I'll hunt up a graph that Sylvania put out a few years back for estimating forces due to vibrational motion, and then you can really 'engineer' this project by figuring just how many 'G's' a mosquito's wings will stand. Right now, though, I want to talk to you about something else." He opened a cupboard and took out two small album-shaped books bound in imitation red leather and another black book with a spiral wire binder. "Here," he said, holding out the red books, "are Volumes 1 and 2 of RCA's 'Pict-O-Guides.' I want you to take them home and study the diagrams, the text, and, above all, the pictures until they are literally sticking out of your big freckled ears." 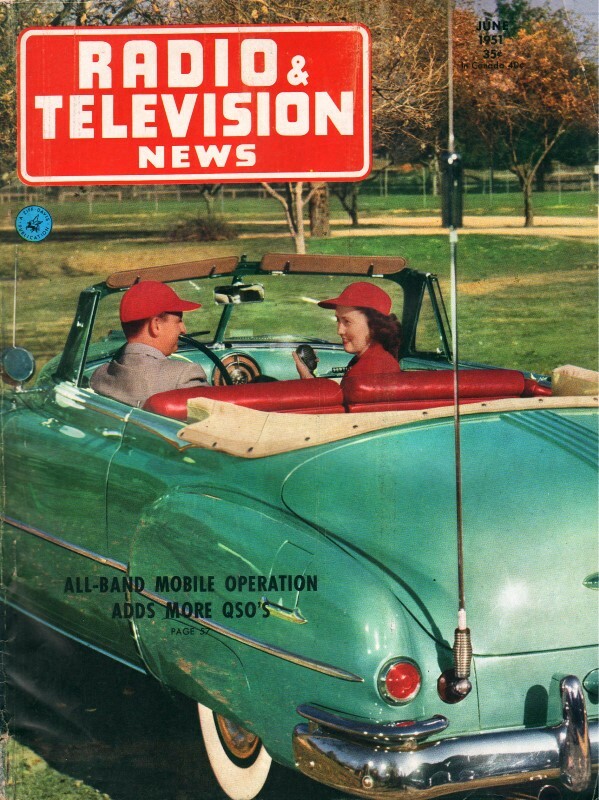 "So you can learn TV servicing easier and better than I learned radio servicing. In the beginning my radio knowledge, like that of most of us who grew up with the business, consisted entirely of scraps of unrelated information picked up haphazardly from experience, from reading, and from what other technicians told me. I wasted ten years before realizing that some way had to be found to tie all of this knowledge together into a compact whole if I was to keep it and get the most out of it. 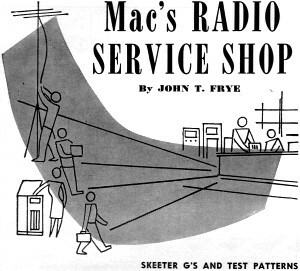 "That is when I hit on the idea of servicing radios as much as possible 'by ear.' Circuits were analyzed in terms of what they contributed to the receiver in the way of sensitivity, selectivity, noise-suppression, and fidelity. Component failures and misadjustments were studied for the effects they had on these qualities in the receiver's output. In other words, all of the information I had collected was rearranged and revised in terms of how it made a set sound." "A system that really works!" Barney exclaimed. "It still seems uncanny to me how you can always tell what's wrong with a set by just listening to it." "Not always," Mac disclaimed; "but by concentrating on this approach both of us keep our batting average pretty good. The funny thing is, though, that I forgot all about this when I started studying television and began to make the same mistake all over again. I studied r.f. tuners, sweep circuits, i.f. systems, flyback power supplies, and so on, as individual units; and I was having one heck of a time trying to keep all of this mass of new information in my head. Then suddenly I wised up: what I needed to do was to apply the same technique to TV sets that I had been using in radio servicing. Each circuit was studied for just what contribution it made to the picture on the screen or the sound from the speaker. Every possible component failure was projected as a defect in the picture or the sound. "That system made all the difference in the world. Once I got it through my thick head exactly how a picture on the screen was put together, precisely what contribution each circuit and component made to the composition of that picture, the whole thing suddenly came into sharp and clear focus" What is better, just as soon as I understood how a good picture was made, I was able to work backward from the picture to the cause of any defects in that picture. "What burns me, though, is that this 'discovery' of mine was old stuff to many people. John Meagher of RCA had been harping on this method of attack for months, and he had been photographing distorted test patterns and explaining what circuit defects caused these patterns. Other companies, too, were and are using test pattern pictures liberally in their service information to illustrate various forms of trouble and misadjustment. "But these two books represent the largest number of clear pictures arranged in a logical order that I have been able to find. I don't want you just to look at them or even to memorize them. I want you to study them. Beneath each picture is an explanation of likely 'causes of the picture distortion in terms of a particular part failure in a typical circuit; but I want you to go beyond that: I want you to give me, in each case, a clear and logical explanation of just why the failure of that component resulted in precisely the pattern disruption shown. "For example, a pattern with reduced height and poor vertical linearity is attributed to the change in capacity of a condenser in the plate circuit of the vertical discharge tube. I want you to explain how an increase in that capacity changes the waveform presented to the grid of the vertical output tube (being able to draw the correct and distorted waveforms) and then go ahead and actually show how this incorrect waveform causes the picture to be stretched 'here' and crowded 'there.' You grab me?" "Yeah, I grab you," Barney said dubiously, "but I'll have to do a heck of a lot of brushing up on my TV theory. You want me to use that group of test pattern pictures as a kind of framework on which to hang all the knowledge of TV theory I have or can get hold of. It would be a lot simpler just to use them as a kind of 'rogue's gallery' for identifying an electronic 'criminal' when I meet up with one, but you aren't satisfied with just catching the crook and clapping him into jail. You want me to psychoanalyze him yet!" Mac chuckled at this complaint and then went on: "After you think you are pretty hot as a pattern-puzzler, I'll use this book of pictures put out by Sylvania as a sort of final examination. There are nearly fifty pictures in here that will be strange to you. When you can just glance at them and tell me the probable cause of trouble in nine out of ten cases, I'll give you your diploma!" It could be worse," Barney said philosophically. "I was afraid you might try taking pictures of tough cases yourself for me to analyze." "Those figures are for a perfectly stationary, fairly-bright pattern. If some part of the pattern is moving, shutter speeds of 1/50 or 1/25 must be used. I'm going to use a close-up lens on my camera and make it a practice to take a picture of every puzzling form of distortion I meet in servicing and which I cannot find duplicated in either the RCA or Sylvania books. These prints will be mounted on 4" x 6" file cards, together with data on the discovered cause of trouble, and then filed in a box or punched and inserted in the "Pict-O-Graph' books." Barney heaved a big sigh. "There goes another of my simple pleasures," he mourned. "Up until now I have always associated a camera with pictures of beautiful babes, but from now on every time I see a Kodak I'll think of a test pattern!"